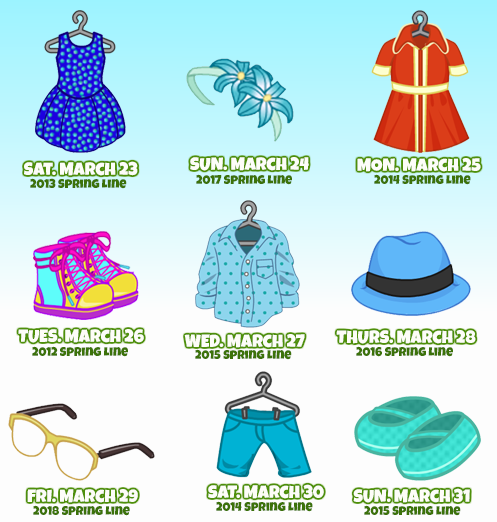 Webkinz is giving away a free piece of retired spring clothing that was once available at the KinzStyle Outlet each day until Sunday, March 31. We’ll also be able to look for floating SPREE dice during the Spring Shopping SPREE. If you see one, click on it to get a FREE Bonus Roll for the game of SPREE (limited to 4 Bonus Rolls per day, 6 for Deluxe players). moms and Sheeba.. Hope you both were able to catch up on a good night’s sleep and ready to start a new week ! So excited to have finally won the Goody Gumdrops trophy yesterday !!!! I have been trying since the introduction of the new game and was like a crazed woman trying to win !! Lurker… looks like the clothing bags are due out on Wednesday…hope you get the items you are looking for. then i need to run to the pet FOOD store – i’m going to transition her to a new food – she gets her stitches out tomorrow – yay! Gaga, congrats on the goody gum drops trophy and also snagging a batch of cookie dough to boot!! Moms and dee..the dress is cute..I don’t remember ever seeing it before..must be one I missed! Moms hope your recovered from prom party! Moms hope you fur baby feels better, and that the stich come out easy and painlesssly! Congrats on the trophy, Gaga! I won it on my boyfriend’s account, but haven’t had the same luck on mine. I think what helped is that he has ads turned on so it slows things down a little. Choco, we’re you able to get the waddles trophy? Dee, many wishes to you and your hubby for a very happy anniversary adventure! Have fun, travel safely! Can’t wait to hear what you two get up too! Hugs!!! PS, may I ask how many years Dee? Chant – No, I gave up on the one. Both of the games were frustrating me after a while. What we need is a tile towers trophy. I could play that game all day. I actually got a second one with only 15 mins or so left to play it! I knew you wanted one and sounded like you might not get one…so I will go in and send it right now! I have a lot of trophies, but sad to say, I traded for a lot of them..I’m lazy. Thank you Chant! I tried, but I’m so bad at both games that I couldn’t get much kc at one time. Sometimes I’d play the icecap game and not get any. I’m still trying for hatch the dragon. I got the trophy in the trading room a while back, but it’s always a nice feeling to win it on your own. I’m not very good at the game, but it’s fun so I don’t mind playing it over and over. Is crystal seas the vacation one? I got real close on that one too, it’s discouraging to get so close but not win, especially on games you don’t like that much and are only playing for the trophy. You are very welcome! I had read what you wrote, and since I was able to find a browser the iceberg game worked on it was pretty easy..and I can play the waddles game ok..just time consuming.I’ll be honest, it took almost 3 hours to finish ..which is why I almost didnt! I finished on last day about 15 mins left..talk about cutting it close.! But I did get it with you in mind to give it to if you weren’t able to get it. I know those games weren’t easy because they don’t work right on all browsers. Anywho, enjoy! Choco… don’t give up on Goody Gumdrops ! You’ll get one… Love to play Tile Towers also…good game to play while talking on the phone ! Chants… Hope your neighborhood has been quiet…How’s your hubby ? Read that he was out and about by himself !! Nice ! dee…. Happy Anniversary ! Have a great getaway ! Hope your kitties behave while you are way ! moms… how did your pup do at the vets?? Hope her stitch removal went well..and she continues to have an uneventful recovery ! For anyone interested the new Vacation Painting is available today at Sheldon’s Shack.. It is really pretty ! WKN reports that the Kiwi Bird Floaties will be staring in April.. sound very similar to the Snow Retriever give away…. collect the Kiwi coins and on Webkinz Day if you log in … you will receive a gift box with 25 Kiwi coins… I think it is very cute ! hope you have a blast dee! We go and get our girl this afternoon. I signed the paperwork this morning- she's just got to get vet checked, rabies shot, and possibly spayed! I'm a little fretful about what post-operative care might entail (e-collar? stitches? vet-follow-up? infection? ), but I trust that the shelter does this all the time, and will tell me what to expect. AND YAY the Kiwi Medallion Event begins on April 1! I've gotten lax about having Webkinz up in the evenings (I just pop in, get the dailies, clothes, and run), but I'll have to work extra hard for this pet! LOVE free medallion pets! Gaga – I might try turning the ads on for my account because that makes it lag a little and that seemed to help on his account. Momz – I already have one for my dragon room, so I think I’m good. I like trying to win them on my own and I like the game enough that I’ll probably get one eventually. I forgot about the kiwi! Definitely want to get that one. I should probably start thinking of names. When I went to adopt the dog in December I realized that I didn’t even have a name picked out for him! Spent the whole month collecting medallions and didn’t bother thinking of a name. puma – congrats on your new baby! are you keeping the name Clover? or really is baby puma choosing the name? seriously though choco – i like something related to New Zealand, and I really like the name Māori, so I might use that as the name for the kiwi. Where are they from? New Zealand? Gotta look more into that area, maybe I can find some inspiration. puma—congrats on getting your new fur baby Clover today! I loved your story! And all the other pet stories too! Stella was just spayed and they gave me pain pills (Rimadyl) for the first couple of days and we choose to keep her in the e-collar for the first couple of days because she’s a licker and we didn’t want her messing with the stitches. After that she’s healed up great. Dh was playing to rough with her one night and I could tell she popped a stitch, but it was only one and it wasn’t bleeding, she was fine and the vet did dissolve-able stitches so we didn’t have to go back. moms—Introverts Unite! Separately, in our own homes. LOL I’ve always loved that saying. I am one too. Glad you’ve recovered from the all-nighter. It sounds like it was so fun, what a great group of kids. I hope your fur baby keeps getting better every day! 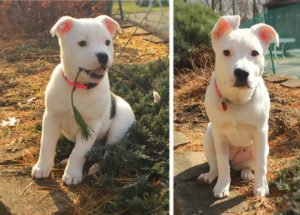 Pic of Stella at 2 months and now 5 months! She grew so fast! I’m also starting to get stressed out about the puppy class…I know, a puppy class! First, it’s peopling. Then we are trying to learn so many things a once and I get uptight and then I think everyone’s looking at me (introverts nightmare) and then I get all flustered and the whole class is waiting on me to get it together. Ugh. dee—Happy Anniversary! Hope you have a great time! cheese—I love the Spring baking Championship! I watch them all…Holiday, Fall, Kids…is there a summer one? Last year was my favorite with Nacho and his cha-cha hands! I have the first 3 episodes on DVR and planning to watch them tonight or tomorrow. I wish they would post some of the recipes online. You can tell when the judges really love something and I want the recipe. choco—coming up with names is the hardest part for me too! chant—I have the same problem with trophy games. I get frustrated and take a break. It’s so crushing to spend all that time and get so close. Glad to hear your dh is getting stronger every day! Excited for the kiwi bird too! Did anyone else realize all their side accounts went back to ‘free’ this weekend. The Jolly Holiday pup’s year is up. I don’t even know where my rubbermaid bin of webbies are. I’m going to have to organize the basement this summer and find them. Oh moms thank you! That was so nice of you! April, Stella is beautiful, glad she’s healing well. And my hubby is doing really good thank you. Gaga, yes, neighborhood has been very quiet, and hubby’s doing well. Thanks for asking! He actually went out early this morning to take my car through emmissions. He does tire easy though.after all he did spend almost a year in bed, gonna take time to get his stamina back. april – stella is such a doll!!!! she grew into her nose spot! LOL those ears are the best! april – here’s how puppy class worked best for us – i would soak in everything they were saying without trying to do too much in class since it was sensory overload for the introvert & the puppy, then i went home and practiced a lot without an audience. April…Stella is so CUTE !! Thanks for the new picture… I love her ears too ! She may surprise you and become the star of puppy class ! Puma.. hope your new kitty is home and settling in… keep us posted. dee… hope you had a nice getaway for your anniversary…. Choco… I also have a lot of trouble trying to come with names for new pets..usually end up choosing something simple and non original..
Lurker… if you are around… let us know about the clothing bags.. I am really curious..
Hello! Longtime lurker, first time poster… first time in a good long while, anyway. With the new mystery bags out I came in search of spoilers… and what I found on the March 13 post just blew me away! Was waffling on how many Kiwi birds I’d collect… I will be going for it on each of my deluxe accounts seeing the other special items that go with that promotion. And I expect my keyboard to wink out any time with all my drooling over the other items. Happy Wednesday! I’m always around, gaga, I just don’t speak up unless I have something important to say. That’s why my name is Lurker, lol! I got at least one of everything except the diamond hair bow in my bags (I bought 22 bags, and I open one on each account…cuts way down on duplicate items in bags that way!) and I managed to trade to get the diamond hair bow a few hours ago, so I’m already done with my collection, lol! Important note: The Bamboo Buddy is not tradeable, and it is also non-functional at the moment. When you try to put the buddy on your pet, you get an obnoxious pop-up message that states you can only put clothing items on pets. So obviously, there’s a big ole glitch there that needs to be fixed! I already had all these, so if anybody needs ’em, speak up! And on another, unrelated note, hi and welcome to Jenn! Oh, before I forget, Chant, if you need a Hatch the Dragon trophy, I will send you one. I win one every time I play, lol. How many you need? Please say you need about 40. And your post has me considering mystery bags… I’d told myself no more clothing… LOL. I am called many things, and not all of them are safe to type on this board! You will see me referred to as Loop or TLL most commonly. I started as TheLonelyLurker, and then this blog had a contest to give me a less pitiful-sounding name, so it became TheLoopyLurker. I am known as SantaLurker around the holidays, and on Update Wednesday, I am TheSpoilerLurker. Sorry for the inadvertent enabling, lol! My post above reminds me…wasn’t there someone a while back who needed a Smoothie Moves trophy for a friend, got one, and then decided they wanted one for themself? I’m trying to find the post, but the search function here doesn’t work that way. So if I don’t find it, person who needed a Smoothie Moves trophy, speak up! I am not playing that sloooooow game on the app unless I have to. TLL, May I have one or two items, please? hello again Jenn!!! TheSpoilerLurker sure spoils us, doesn’t she?! I love the sneak peeks! Dixiecup, sure you may! Just let me know which ones and make sure QueenieB15 is on your phone and I’ll get them right out. AHA! I found the post where somebody wanted a Smoothie Moves trophy. Only took me an hour! (But then, that post was way back on January 31!) It was Mist! Mist, do you still need that trophy? I can’t find a post where you confirmed you want me to win a trophy for you. Let me know, thanks! From the same post, I see Cheese sent moms a Sweet Snowman Hat code for me. (And eternal thanks for that, Cheese!) But I just checked WI and there’s no code waiting for me. moms, do you have the forwarded code for me? If not, does anyone else have a Sweet Snowman Hat code? I forgot all about that, and it’s the only thing I missed over Christmas with the death of my father-in-law. Speaking of my father-in-law, I have a heartbreaking question. The first day of trout season is a very big deal in my state, and that’s something my hubby and his dad always did together, for my hubby’s entire life. This will be the first day of trout season ever that my hubby can’t go fish with his dad and he’s, well, he’s wrecked. What should I tell him? Go anyway with our kids to keep the tradition alive? Stay home and dedicate the day to remembering his father? I’m so on the fence here, because I don’t want to upset him more than he already is. What would you ladies advise? DEE! what are you doing here? are you back? so glad you got it TLL!!! It is there, moms, thanks! It was showing up as read even though I’d never seen it. I had two other new messages there that were also showing up as read. Weird! I had forgotten that I gave WI a birthday, so I had a few birthday wishes. Of course, it wasn’t my real birthday that day, lol! My real birthday is never posted on the computer. Yeah, I’m paranoid. stinks as our friend we wanted to visit was out of town as i wanted to make baklava and give them some…………..who else can i share baklava with? we are so totally here to tell other people what to do! i have only seen in once before waaaaay back when in san antonio (and have a pic)………cute as one year, they got me the hot wheels version in my stocking. no clue why i find it so fascinating………i was going on and on about how does it drive down the interstate? where does it park? dh was almost ready to give up on me. TLL, go .. with the kids, build a new tradition. Recall fondly, tell stories of his Dad. Catch one for Dad and release it. I think the things that he most enjoyed would be an awesome legacy to pass down to his kids. I think I might have you already on my Kinz Phone, just not sure which account? Dixiecup would be the most likely. I would really like the Pretty prairie dress and the Purple blossom hat, please? Oscar Meyer – didn’t i name a webkinz dachshund that??? i would definitely want a photo with it – that sounds like a fun getaway! i’m going to make a career tech or home ec/cosmotology classroom with my school rooms in WW … i have salon stuff, the cooking griddle, interior decorating stuff, what else should i include? i will search around the dock and find a sewing machine … any other ideas?